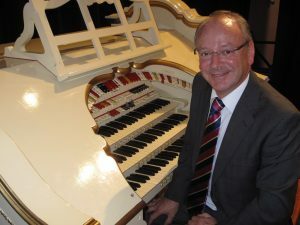 The Blackpool Tower Ballroom is home to what must be the most famous and most commercially played Wurlitzer organ in the world and Phil Kelsall has amazingly now just completed his 40th season playing in the Ballroom, all but one of them as principal resident organist. During the ‘off season’ in Blackpool, Phil makes a number of concert appearances each year, both in the UK and in the USA. Back in Blackpool Phil has always welcomed the opportunity to showcase the Tower Ballroom Wurlitzer on TV and radio and his broadcast credits include Songs of Praise, Coronation Street, The Antiques Road Show, Last of the Summer Wine, The Archers, Friday Night is Music Night and Great British Train Journeys to name but a few. Phil has also been pleased to appear with leading personalities such as David Soul, Barbara Windsor, Rod Hull (and Emu! ), Jo Brand, Strictly Come Dancing’s Len Goodman and Michael Portillo. Phil has over 40 albums and many DVDs to his credit, estimated to be more than any other organist in the world. An album of Phil’s light classical recordings even entered the Classical Albums Top 20 Chart where it was to remain for an amazing twelve consecutive weeks, an unprecedented achievement for a theatre organ album. In the digital age, Phil’s recordings are heard all over the world, including perhaps less obvious countries such as Turkey, South Africa and Japan. It is in recognition of Phil Kelsall’s contribution to the world of organ music that several honours have been bestowed upon him by the music industry. No fewer than three of Phil’s recordings have won The Music Retailers Association’s awards and Phil has been proud to receive the coveted Gold Badge Award of the British Academy of Songwriters, Composers and Authors for his service to the British music industry. Fellow recipients of this award have included Dame Shirley Bassey and Jools Holland. Phil was particularly proud to receive the MBE in 2010 for services to music.